To shake off the winter grey, Stacey and I ran an online color-naming experiment. Each user was shown a random color and asked to type in a name. We asked people provide the most generic name possible, dropping things like modifiers (blue instead of light blue). 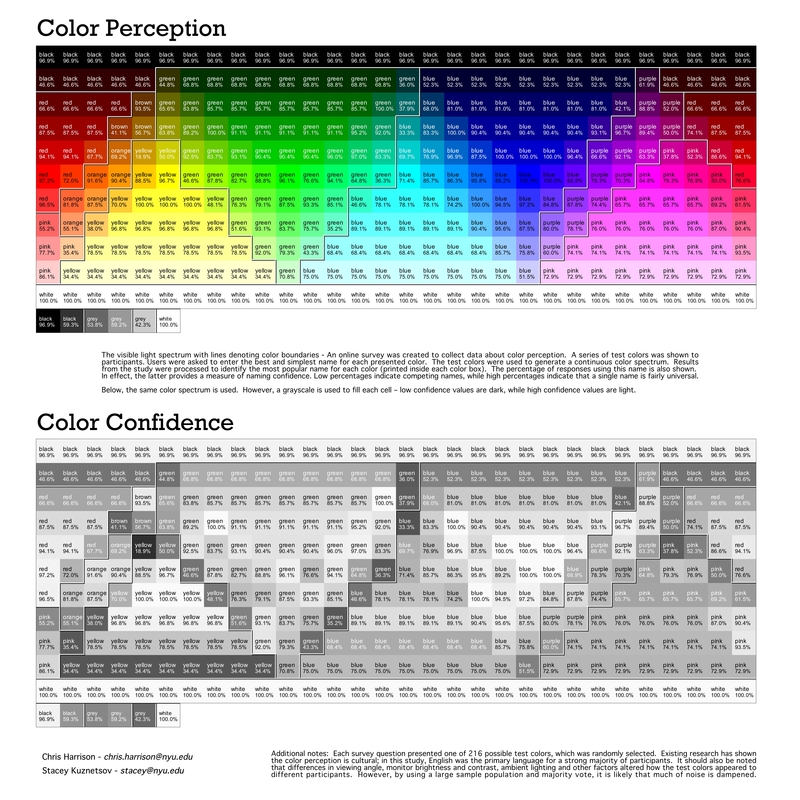 Instead of using the entire RGB spectrum (millions), we pruned the color set to 216 "web safe" colors. This helped ensure every color had many responses. We left it online for a week or so and collected 6,276 color responses. We compiled the outcome into the infographic below. This data was also used in the Color Flower project. Note: Existing research has shown the color perception is highly cultural; in this study, English was the primary language for a strong majority of participants. It should also be noted that differences in viewing angle, monitor brightness and contrast, ambient lighting and other factors altered how the test colors appeared to different participants. However, by using a large sample population and majority vote, it is likely that much of noise is dampened. We ran this experiment for fun back in February of 2007. There have been two similar and awesome projects since then: In March 2008, Delores Labs ran a similar study on Mechanical Turk. In May 2010, XKCD ran a huge version, and highlighted some interesting gender differences. The visible light spectrum with lines denoting color boundaries. Results from the study were processed to identify the most popular name for each color (printed inside each color box). The percentage of responses using this name is also shown. In effect, the latter provides a measure of naming confidence. Low percentages indicate competing names, while high percentages indicate that a single name is fairly universal. The same 216 color spectrum seen above is used. However, a grayscale is used to fill each cell – low confidence values are dark, while high confidence values are light.